Scaly leg is a disease of chickens and other birds. It is caused by a parasitic mite, knemidocoptes mutans. The mite usually buries under the scales in the bird's legs but may also infest other areas such as the comb or wattles of chickens. 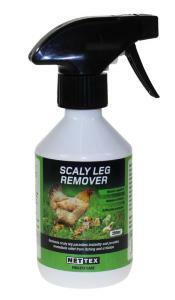 This specifically designed formulation is designed to effectively control the scaly legs parasites. Contains a synergised blend of natural oils and repellents that forms a protective coating to smother and suffocate the mites and also acts as a deterrent against further infestation. It will also immediately relieve any itching or irritations.